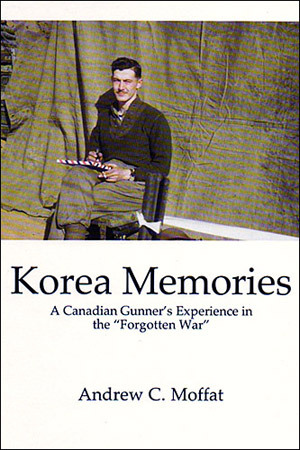 A Canadian Gunner’s experience in the ‘Forgotten War’. The book starts with the author being informed that he is shortly to be posted to Korea, and ends with an assessment made 50 years later following a revisit to South Korea. Not a traditional war story, but rather the personal experiences and reminiscences of the author; many of which reinforce the idea that our lives are ruled by ‘chance’. Tears, thrills and laughs — the essence of war. There are many levels of friendship and many a basis for forming friendships. Some ties are found in bloodlines, some in common interests, some in common backgrounds, and yet others in some mystique of physical or emotional attraction. Some friendships require a constant contact to remain viable; others remain strong in the mere knowledge that the other person ‘will be there’ if needed. Some friendships need open expression; others enjoy a sort of ESP existence. In ‘Action’ there are ties that stand apart from all others. Even a fleeting moment when two soldiers share a danger when each knows that his life is in the hands of the other, when a unique level of total trust exists… that lasts forever. Even if the two have never formally met, don’t know each other’s name, and never cross paths again, a friendship that has no parallel comes into existence. I had two signalers in my OP, Jack Christensen and Paul Gautier. We came from very diverse backgrounds: Jack a Newfy, Paul a Quebecois, and me a Prairie boy. We had never met before Korea and our military paths never crossed after Korea. But when, 40 years later, I sought a disability claim with Veterans’ Affairs, both appeared out of the blue with affidavits of supporting evidence. In 2000 I received a letter from Jack’s widow Shirley, to tell me that Jack had died. After a mere 3 1/2 months together and 47 years of separation I had lost a dear and close friend!